Berget Farms is a LASA member, and Mike Berget serves on the LASA board. The Bergets split the application of Nitrogen on their crop land. They apply the Nitrogen three times during the season – 1/3 is applied with the planter, 1/3 is applied to the growing crop just before canopy and 1/3 is applied in the fall as anhydrous ammonia. Also, in the last five years, Bergets have built seven miles of 40 foot waterways on their own. They also monitor end rows to divert water back to the road to prevent erosion. 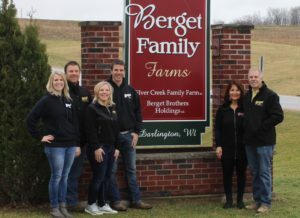 Berget Family Farm has 6,500 acres of strip tillage and 2,000 acres of no-till, with only 700 acres of NHEL ground that is worked. They have 50 acres of fall cover crosp where manure was applied. And this fall, all ground that receives manure will get a cover crop of Rye applied. All ground is soil tested once every three years. Silver Creek Family Farm, also part of the Berget Family Farms, is a farrow-to-wean operation. They have approximately 1500 sows in the building that produce F1 breeding gilts. Congratulations to the Berget family on your 2018 Soil Stewardship Innovation Leadership Award!